Cosmonauts Oleg Kotov, Expedition 38 commander, and flight engineer Sergey Ryazanskiy perform a spacewalk outside the International Space Station on Dec. 27, 2013. NASA astronaut Rick Mastracchio took this photo from inside the station. Two Russian cosmonauts installed new HD camera eyes on the International Space Station during a record-setting spacewalk Friday (Dec. 27), only to have to return the devices inside due to an unspecified data glitch. Cosmonauts Oleg Kotov and Sergey Ryazanskiy spent just over eight hours — a new endurance record for Russian spacewalks — working outside the space station to install the new Earth-watching cameras for the Canadian company UrtheCast as part of an agreement with Russia's Federal Space Agency. But shortly after the installation, Russian engineers reported a problem receiving data from the imaging system. The new cameras are designed to snap detailed views of Earth from space for UrtheCast, which will then provide the imagery to customers via the Internet. They launched to the station in late November on the Russian Progress 53 cargo ship. "UrtheCast's two cameras will stream unprecedented footage of our evolving Earth to anyone with an internet connection," the company's website promises. "In near real-time, you will be able to visit your favorite locales and learn about current events as they unfold." The UrtheCast cameras include a high-resolution instrument on a swivel platform for detailed observations, and a medium-resolution instrument attached to a fixed platform. 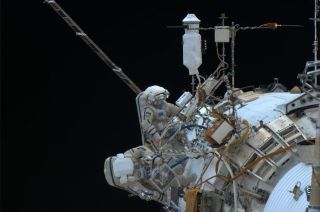 Both cameras were initially installed by Kotov and Ryazanskiy on their respective Earth-facing platforms outside the station's Zvezda service module. "When the flight control team at the Russian Mission Control Center outside Moscow did not see the expected telemetry and electrical connectivity from the newly installed medium and high resolution cameras, Kotov and Ryazanskiy were directed to remove the cameras and return them to the airlock for further analysis," NASA officials said in a statement. "The spacewalkers also were instructed to take detailed photographs of the electrical connectors mated earlier for additional review." UrtheCast officials have said the company has up to $21 million worth of annual distribution agreements already lined up, and received letters of interest from potential Earth imagery customers that could be worth $79 million each year, according to a report by SpaceNews. Kotov and Ryazanskiy also installed a new earthquake-monitoring experiment, called Seismoprognoz, and removed an older experiment that tracked the seismic effects of high-energy particles in the near-Earth environment, NASA officials said. That older experiment, called Vsplesk, was installed in 2008. The spacewalkers disposed of it by tossing the experiment into space in a direction that won't endanger the space station, NASA officials said. The spacewalkers also planned to jettison the frame of an old material exposure experiment, as well as retrieve a case of samples from a materials space exposure experiment during their work outside the International Space Station. Friday's spacewalk was the third in a single week for the six astronauts and cosmonauts on the International Space Station. It marked the fifth career spacewalk for Kotov — who currently commands the station's Expedition 38 crew — and the second orbital excursion for Ryazanskiy, a flight engineer. NASA astronauts Mike Hopkins and Rick Mastracchio, as well as Japanese astronaut Koichi Wakata, round out the crew. The previous two spacewalks, on Dec. 21 and Dec. 24, were performed by American astronauts to replace a vital coolant pump on the space station following a Dec. 11 malfunction. Today's excursion was unrelated to those earlier events, NASA officials said. In 2013, astronauts and cosmonauts performed a total of 11 spacewalks outside the International Space Station. Friday's spacewalk lasted eight hours and seven minutes, making it the longest Russian spacewalk in history. The world record for the longest spacewalk is eight hours and 56 minutes, a title won by NASA astronauts Jim Voss and Susan Helms in March 2001 while working at the space station.